Can music be gay? Listening to soundscapes in Provincetown. 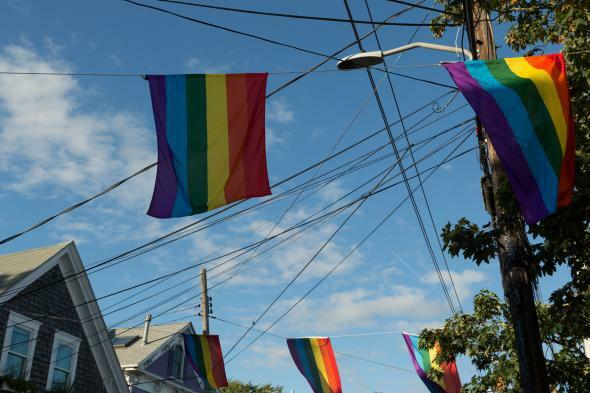 Rainbow flags in Provincetown, Massachusetts. It’s a Thursday afternoon in late summer, and I’m sitting at a bar with a straight friend of mine. Lady Gaga’s “Edge of Glory” fades in on the loudspeaker. I offhandedly comment that I expect to hear this song pretty often at my upcoming weekend in Provincetown, Massachusetts with my husband. My friend looks at me blankly. I pause and think a moment. It’s always been so obvious to me that something essential about this song seems to be oriented toward my gay identity. And it’s not the words, nor the singer’s sexuality—Lady Gaga’s personal bisexuality seems beside the point. Rather, it’s in how the music sounds, how it’s built and composed. But my friend’s obliviousness is indicative of another layer. The musical gayness that is so obvious to me is invisible to him. I wonder whether there are reliable characteristics of music that can make a song obviously appeal to my particular sexual expression, while still “passing” for mainstream music. What makes music sound gay to me? 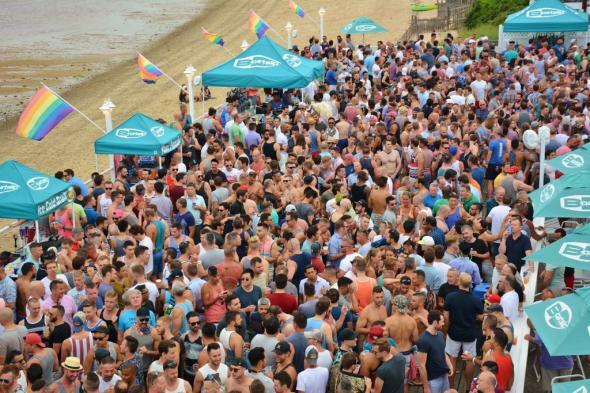 So, I took an audio recorder to Provincetown to record how places would signal this particular kind of gayness through particular kinds of music. This village (affectionately called “P-town”) on the tip of Cape Cod is something of a Mecca for a certain type of gay male: On busy weekends, the main artery, Commercial Street, becomes a sea of men whose tank tops and polo shirts are all basically identical and could all easily be in my dresser drawer. Looking at this crowd, there are clearly issues of race, economic class, and gender all wrapped into this identity, since I’m not just hearing this music as “gay” but as a gay, liberal, urban, white cis-male—a Dan Savage, Truman Capote, Oscar Wilde kind of gay. And so, when a restaurant, club, or show wanted to communicate that their space was where I belonged—was this kind of gay space—I turned on my recorder. I start recording around noon on a Saturday. At this point in the day, the town’s gay community is mixed with heavy doses of day-trippers with two-way same-day ferry tickets and families punctuating their Cape Cod vacations for a couple hours before returning to their cottage rentals in Truro or Wellfleet. The music reflects this eclectic mix: I recorded the music outside one family-friendly diner playing Billy Joel, heard indistinct Latin-ish background music as we walked by a packed dining patio, and found French-bistro-style underscoring wafting from an upscale cocktail lounge. This was, by my estimation, not gay music. But the last ferry back to Plymouth leaves at 4:30 p.m., which is coincidentally the beginning of P-town’s Tea Dance. This daily party—now the place to begin your gay evening—grew out of the long tradition of men meeting under the auspices of “having tea,” an excuse designed to skirt the legal codes of the not-too-distant-past when homosexual gatherings were explicitly forbidden. Tea Dance at the Boatslip Beach Club. Walking to Tea, the aural scene had already become distinctly more “gay,” with a version of “Mmmbop” wafting from a karaoke happy hour and a group of men drinking cocktails on the porch of their hotel to a soundtrack of Madonna’s “Hung Up.” As we approached Tea, the sound of dance remixes of pop songs pounded louder and louder: I captured a couple such aural snippets. As we paid our cover, I turned off the recorder; we mingled and danced to remixes of Whitney Houston’s “I Wanna Dance With Somebody” and Icona Pop’s “All Night.” Tea then transformed into an “After Tea” dance a few doors down—during this transition, I paused to again record a series of soundscapes before rejoining, sounds that again featured much of the same dance-mix textures. At this point, two trends were becoming clear. First, and most obviously, the gayer spaces became, the more throbbing dance beats they used. On the one hand, this should be an obvious musical choice—these spaces were explicitly dance parties. But on the other hand, it’s actually not trivial: The more exclusively gay the space became, the more fun it became. When these clubs let this type of music waft into the street, they are saying that I can come in, join people of a similar identity to me—my Andy Cohen, Michael Kors, Neil Patrick Harris gayness—and let loose. And this is really important: When you move through the world with a non-mainstream identity, it can feel extremely liberating to find yourself in a space where your identity suddenly becomes the mainstream. This liberation—this visceral celebration—is, I think, why “gay music” is often “dance music,” and why dance music can be so easily co-opted into gay spaces. Second, these audio clips show it to be almost exclusively female voices singing to our sweaty (mostly white) bodies, and often women of color. There’s a lot of overlapping motivations behind this (and the cocktail of these motivations is probably mixed differently for every gay man), but the search for strong figures outside traditional masculine culture probably gets the most traction. While born out a respect, this means that gay white male musical tastes seem to be grounded in other marginalized voices, often voices with far less privilege than the men consuming it. Leaving After Tea, we walked toward the center of town, where we found the streets transformed from alleys dotted with individuated pods of self-conferring tourists into an alloy of forming and reforming flocks of gay men. We ran into Jinkx Monsoon (winner of season 5 of RuPaul’s Drag Race and my husband’s favorite drag queen) performing on the street to sell tickets for her show later that night. Walking past the Crown and Anchor’s piano bar, we heard a crowd of intoxicated male voices erupt into the climax of “Oh What a Beautiful Morning.” We then ducked into Varla Jean Merman’s drag show, a classic example of gay camp that irreverently mashes together intelligent highbrow cultural criticism with lowbrow slapstick. At each juncture—from the street sing-alongs to campy drag-queen parodies—there is a sense of community built through sound: through inside jokes, songs that everyone in this particular community knows, and old-fashioned camp. In P-town, these kinds of “we-all-get-it” musical moments become more prominent after dark, after the tourists (read: straights) have left. At this point, performers and listeners alike can metaphorically wink at one another, and sing along to songs we all know we all know. And this uniquely tracks with what it means to be a gay white male of this variety—a Michael Musto, John Waters, Anderson Cooper gay. Almost unique among minority identities, we have the ability to pass for majority/mainstream identities. These inside musical jokes are very similar to what I think of as the “gay flirty wink.” As a gay man, you learn to recognize moments when the guy passing you on the street looks at you with a glance that’s just-a-little-too lingering. These are ways (my brand of) gay men have learned how to move throughout the world unnoticed by the scrutiny of normative straight interaction, but noticed by other gay men. Arising from the balance between the advantage of our gender but not of our sexuality, we socialize modes of flirtation with the openness available to our male privilege, while flying just under the radar of heterosexuality. The musical choices that have become intertwined with gay culture are a lot like this wink, and this is why, I think, my straight friend didn’t hear Lady Gaga as “gay.” We have a history of choosing gay anthems that are not explicitly “gay,” but rather are mainstream pop songs that in some peripheral way communicate non-mainstream identity. Songs by women or minority artists allow us to identify with the “otherness” and “difference” of the singers, but—by virtue of them being mainstream hits—humming them as you walk down the street won’t necessarily out you. Jinx Monsoon, for instance, sang a song by The Shirelles’s, a group of black women whose music was designed to appeal to white audiences—marginalized voices that pass in the mainstream. But while the motivations behind these song choices might be rooted in subtlety, when music is being “gay music,” it is anything but subtle. In spaces like P-town, clubs with our friends, or even the bathroom mirrors of our teenage years, we gays let our guard down: That small muscle that is constantly flexing to help us pass in the world gets to finally relax. Certainly, many minority identities have it far worse, but it’s hard to be gay. I still study the floor tiles in locker rooms as intently as I did when I was a closeted middle-schooler; my husband still flinches at our local dive bar whenever a group of straight men become a little too sloppy and loud, worrying about how they’ll react to us once they become drunk enough. Finding yourself in a room where everyone—everyone—knows the words to a song from Oklahoma! or pumping your fists to Whitney Houston or joining in a crowd laughing at a drag queen making a campy and silly pun … these things make you feel like you belong. Even while aspects of this music echo our neurosis and closeted pasts, when it’s played in spaces like P-town, it loudly and openly expresses our particular brand of gayness, the Lance Bass, Elton John, Clay Aiken gays. These songs “come out,” moving from being secret winks to being musical manifestations of the safe communal venues where (my kinds of) gays can loudly, viscerally, cathartically, and proudly celebrate who we are, and the history of how we got here. The next day, as we left Tea Dance, the DJ began to play Whitney Houston’s “My Love is Your Love.” The sea of men roared—roared—together along with the chorus, “Cause my love is your love, And your love is my love.” We had all experienced childhoods of staring at gym floor tiles, early adulthoods of skittishness around drunk frat boys, and had all read Justice Kennedy’s majority opinion on June 26, 2015 with tears in our eyes. We were all pumping our fists to the voice of Whitney Houston, a song originally about race relations that we were adopting as our own. It was fun. It was liberating. It was probably a little problematic. But it was beautiful.